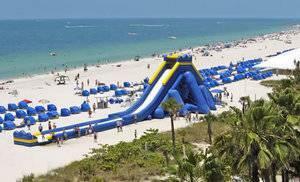 The largest Inflatable Wet/Dry Slide in the WORLD!!! Can also be used as a Dry Slide. This thing is 4 Stories Tall! This Slide is great for Large Events that want to draw the Most Attention. Great for Larger parties like: Church, School, Carnivals, Fairs, Festivals, and Corporate events.